How do I know the dog is detecting Bed Bugs and not another pest? 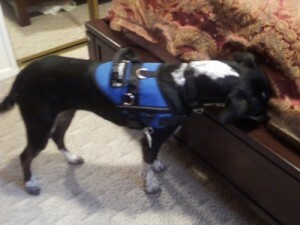 Our dogs are trained solely on live Bed Bug scents and no others. Training dogs on more than one scent can cause the dog confusion and cause false alerts. Our dogs are trained to ignore other pests and will only alert on live bed bugs. We also provide a demonstration using a control hide to show our customers the dog’s ability before proceeding with the inspection. How do you know how accurate Magic is? We take our detection services seriously. Our dog, Magic, is trained daily and her accuracy results are documented. We use a food reward training method which is the highest standard available for training and used with police dogs, bomb dogs and other highly skilled K9 Teams. Are dogs more accurate than an inspection with a regular technician? Yes, our dog averages an accuracy rate of 97% (which is documented). Each technician and team is different but humans have been shown to have accuracy rates of 30% in finding Bed Bug infestations. Why do I need a dog – can’t I just find the bed bugs myself? You may be able to, but only if the infestation is large enough. That being said, Bed Bugs are nocturnal (they usually only come out at night when most people are asleep) and generally are not easily found during the day. Their anatomy allows them to flatten out and hide in the smallest of places, such as in-between boards, screw holes, cracks and crevices. When do I need to use a dog? When visual inspections cannot confirm an infestation and when you want to know if more than one room is infested. Using a dog to confirm which rooms are infested and which are not can reduce the cost of having to treat the entire home, apartment or building. 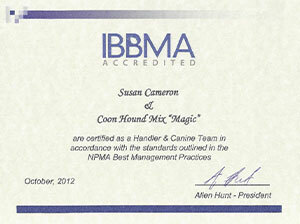 Yes, we use certified dogs for our inspection services and Magic was trained at the Iron Heart Training academy. * See video on K9 Inspection page. 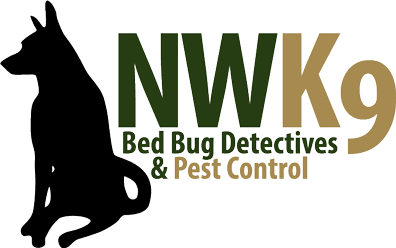 Our Bed Bug Detection training includes education on the National Pest Management’s Best Practices For Bed Bug Management and we have been trained on Bed Bug Biology, Habits and Different Treatment Methods as pertain to the Integrated Bed Bug Management Techniques. Our Staff is trained and certified to use “Best Management Practices for Bed Bugs” through the IBBMA based on the standards set by the National Pest Management Association. Certification Tests are timed and the dog must locate live bed bug hides in a set time period to pass and become certified and not false alert on distraction hides. Teams are required to be re-certified regularly to prove that their skills remain up to the standards set by the IBBMA & NPMA. Ongoing Training: We train our dog regularly to keep up her keen sense of smell. Every handler and dog is trained and certified prior to any inspection taking place. For more information on Magic’s training, please contact Susan today.